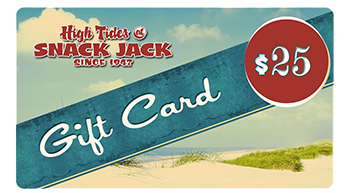 High Tides @ Snack Jack is a laid back, old Florida restaurant with stunning views of the Atlantic Ocean. Join us for a savory meal and drink and enjoy the beautiful beach lifestyle right here at Flagler Beach, Florida. We feature wild caught seafood, traditional southern fried baskets, and many organic options all packed with High Tide’s famous local flavor. Our delicious menu items are prepared carefully to order, helping meet and exceed taste essentials that every guest deserves to enjoy. So sit back and relax, take in the ocean breeze, and watch the waves roll in… let us be your little slice of paradise!